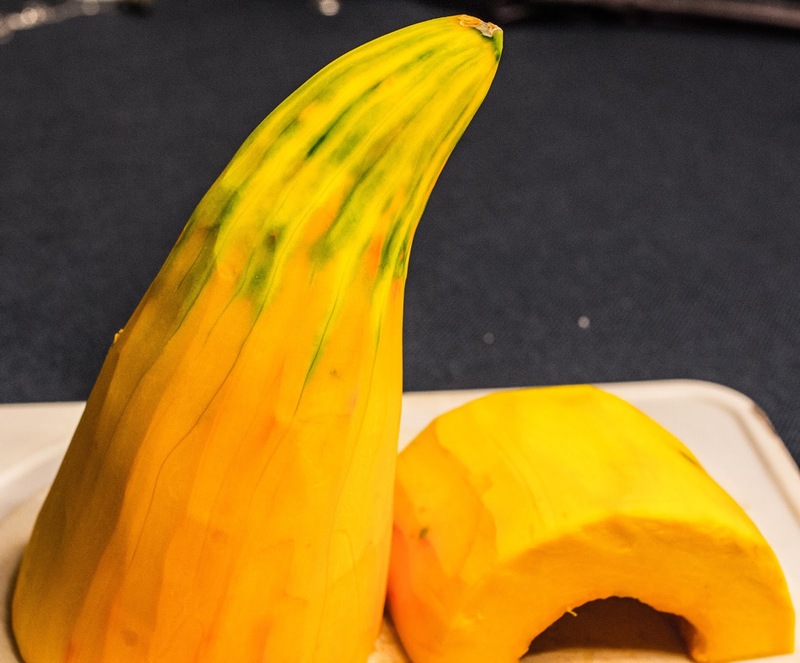 This elephantine-sized squash was a lovely and delicious gift from Diane and Bruce at Cramer Farm. A few weeks ago, while visiting the Bellefonte Farmer's Market, Bruce asked me if I had ever heard of a "candy roaster squash." I hadn't and he offered to give me one the following week to see what I thought of it. If I remember correctly, he received the seeds this year from a friend in one of the Carolinas, who is having great success in growing these peculiar squash. So this year Bruce started to grow some, and soon he had these enormous, torpedo shaped squash popping up in his garden. 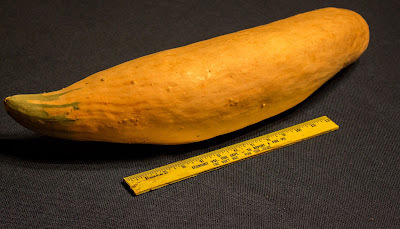 This particular squash probably weighed in at about 10-12 lbs and had a rind the color of a butternut squash. The tip of the squash turned a peculiar bluish-green, like a blue Hubbard squash. 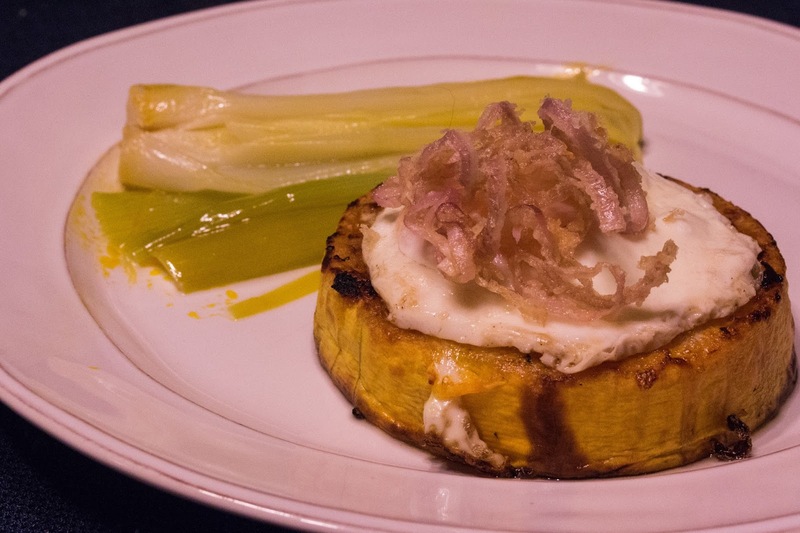 It's a spectacular eating squash. The candy roaster has very firm flesh that's more like a sweet potato than a stringy winter squash. Slicing the candy roaster down into manageable chunks, Carla remarked to me that the thick rings of squash would be perfect for filling with something. Perhaps a poached egg? Toad in a Hole squash? That sounded like a great idea and I set to work. 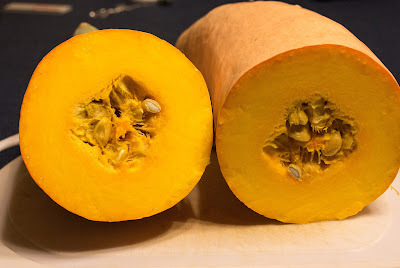 I cut the squash into 1" rings, peeled them, then removed the seeds. The rings were baked at 375 for about 30 minutes until tender. Then I removed the rings, placed them in a hot skillet and cracked an egg into the center hole of each squash ring. Two eggs are perfect for me, so I also fried a second egg to top off each ring. Some poached leeks and fried shallots finished off the plate. I really enjoyed this dish, and kudos to Carla for coming up with it. The tender squash was perfect with the runny eggs, all mopped up with a few leaves of leek.